One of my favorite pastimes is to take apart jewelry that I purchased from thrift stores and make new things out of it. When I do this, I end up with a lot of odds and ends of chain. It occurred to me that some of these chain pieces could be the foundation of a convertible bracelet design. 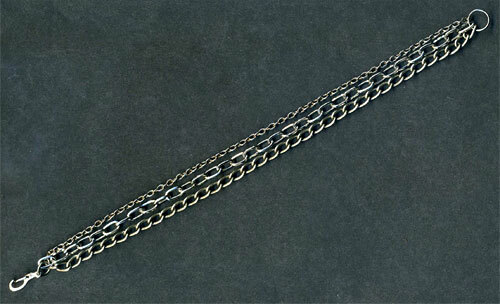 Three strands of different silver colored chain make a good base for a convertible bracelet. 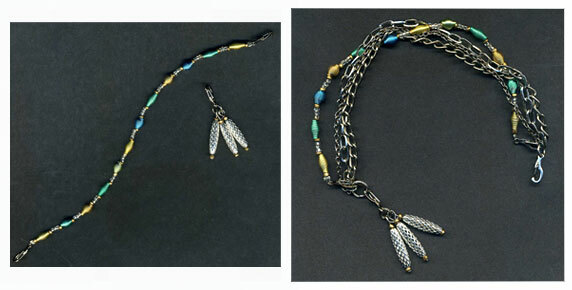 In this example, I linked three lengths of chain together with a small jump ring on one end with a lobster clasp, and a larger jump ring on the other. The larger jump ring will be needed to accept multiple items clasped to it later. 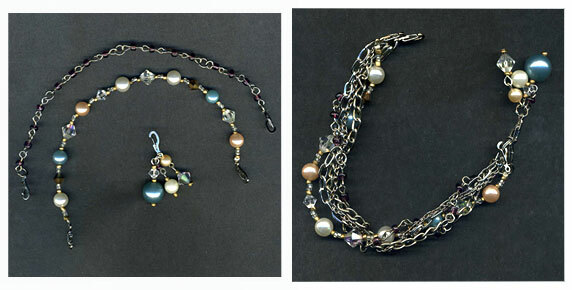 This bracelet can be worn as is, or used as a necklace extender. Next I made some parts that I can attach to give the bracelet a different look. I made a narrow strand of small beads with small lobster clasps at each end, and a dangle that consists of three silver colored beads on head pins attached to a small jump ring and a small lobster clasp. The picture on the right shows the bracelet with the convertible parts attached – I twisted the bead strand around the bracelet and clipped it to the jump rings at each end, and clipped the dangle to the large jump ring. I had so much fun with the previous set that I made another, this time with two strands of beads. These short bead strands could also be used as necklace extenders and the dangles could be attached to necklaces in strategic places as well. Think of all the different combinations you could have fun with! See my tutorial on convertible necklaces for more convertible jewelry ideas!